2015 Johan Vineyards “Farmlands” Pinot Noir, Willamette Valley, Oregon. Dag J. Sundby makes some compelling wines, from Norway Sundby has hit the Oregon wine scene like he’s always been a part of it, and in a short time made a big name for himself, along with his winegrower Dan J. Rinke, all the wines are from organic grapes with all of the Johan estate being farmed biodynamic. 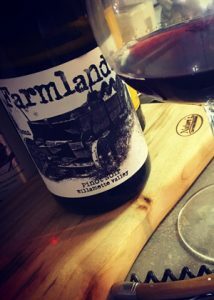 The main estate Pinot Noir and his Gruner Veltliner are the signature wines, but be sure to check out his fabulous Pet-Nat Sparkling Pinot Noir and maybe the best deal in American wine, the Farmlands Pinot Noir! The 2015 Johan Vineyards “Farmlands” Pinot Noir is made from all biodynamic estate grown grapes, native yeast fermented and spends 9 months in French oak, inspired by the wines of Burgundy and the natural wine movement, it is an unfiltered, unfined Pinot without any additives, no egg whites, no cooper sulfate and no enzymes just natural and pure as can be. The 2015 is rich and detailed with low 13.3% alcohol a beautiful deep color and layers of dark fruit with mineral and spice as well as gentle wood notes, this is impressive stuff and as mentioned one of the best deals in American wine, let alone classy Oregon Pinot Noir with real depth of terroir and character. The layers of plum, black cherry, tangy currant and blackberry fruits dance on the palate in youthful harmony with ripe/sweet silky tannins, bright acidity, a medium body and good length with hints of fennel, cedar, dusty stones and flinty pepper. The smooth textures show the grace and finesse of the winemaking and without question highlights the pleasures of the vintage, which is in many ways similar to the 2014 with it’s forward style, drink over the next 2 to 5 years, it’s a beauty.